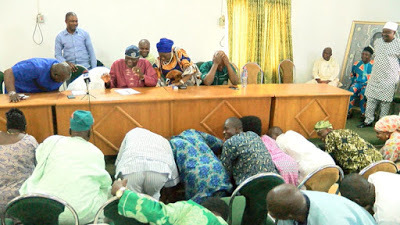 The chairman of the PDP caretaker committee in Osun state, Alhaji Sarafadeen Ishola led a delegation of chieftains of the party to Oyinlola at his country home in Okuku where they delivered the party’s apology and asked for the forgiveness of the former Osun state governor, prince Olagunsoye Oyinlola At his country home okuku today 03/10/2017. 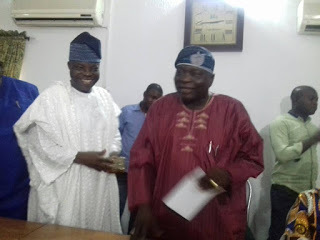 Osun PDP caretaker chairman, Alhaji Sarafadeen Ishola said the visit was not to lure Oyinlola back to the party but to apologize to him for the injustice meted to him by the party. While responding, Oyinlola said he cherished the visit and explained that he felt concerned that issues went the way they went during his last days in the PDP despite all his efforts to ensure the unity of the party was protected. He said the reign of indiscipline and impunity within the PDP led to his exit and the series of crises within the party as well as the division that later resulted in the electoral setback for the party. “I want to say that I did everything humanly possible to make sure that the division did not come from me. I went to the extent of writing to the leadership of the party, the then Mr. President to draw his attention to the issues that were eroding on the unity of the party but it seemed my own sincerity about the whole issues were misconstrued”, Oyinlola clarified‎.